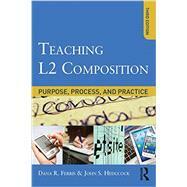 Teaching ESL Composition: Purpose, Process, and Practice, Third Edition, presents pedagogical approaches to the teaching of ESL composition in the framework of current theoretical perspectives on second language writing processes, practices, and writers. Like the popular second edition, the text as a whole moves from general themes to specific pedagogical concerns. The focus is on providing apprentice teachers with practice activities that can be used to develop the complex skills involved in teaching second language writing. Although all topics are firmly grounded in reviews of relevant research, a distinguishing feature of this text is its array of hands-on, practical examples, materials, and tasks. The synthesis of theory and research in a form that is accessible to pre-service and in-service teachers enables readers to see the relevance of the field#xE2;#xAC;"s knowledge base to their own present or future classroom settings and student writers.